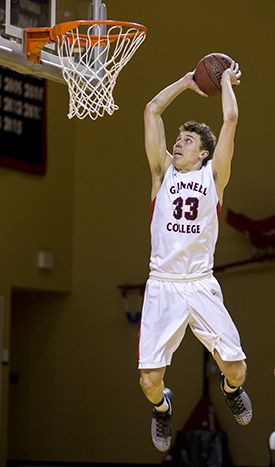 Nick Curta ’17 first heard about Grinnell when his high school basketball coach was thinking about introducing the “System” (the “System,” as in Coach Dave Arseneault and Grinnell College) as a style of play at Dwight D. Eisenhower High School in Blue Island, Ill. And because the coach was his dad, Curta got a unique perspective on the rationale behind using it. “My dad had been coaching probably 15 years when he realized he was doing what everyone else was — playing six or seven guys with the rest sitting on the bench,” says Curta. “They were winning games, but not everyone was having fun. It was kind of a day-in, day-out basketball grind. As he researched colleges as a high school junior, Curta decided Division III athletics was the right move. “I didn’t want to go to a program where I’d be a walk-on,” he says. “I wanted to go to a program where I’d play and be an integral part of the team.” But the National Honor Society president and AP Scholar in high school didn’t choose Grinnell solely because it is the mecca of System basketball. A double major in economics and political science, Curta has earned academic all-conference status in each of his first three years. His plans are to attend law school after graduation. On the court, Curta is a force under the basket. He finished 2015–16 as the Pioneers’ leading rebounder (111, 4.8 per game) and tallied 26 blocked shots. While scoring is not his primary role, he converted a healthy 78 percent of the 65 shots he took from the field last season. “They’re always at all our games, so before a game it’s a good-luck text, ‘Go out there and play hard.’ They’re very motivational and supportive of everything that we do. A lot of Thanksgiving holiday calories were burned off when Greenville College — a team that also employs the System — invaded Darby gym Nov. 29 for a matchup of college basketball’s two highest-scoring teams. Grinnell prevailed 151-128 over the previously unbeaten Panthers, who had entered the game with a national-high 140 points-per-game average. Along the way the Pioneers set a Division III record of 54 free throws made, topping the old mark of 53 set in 1988 by University of California-San Diego. Grinnell’s final scoring play of the contest was a Vinny Curta dunk on an assist by Nick Curta.